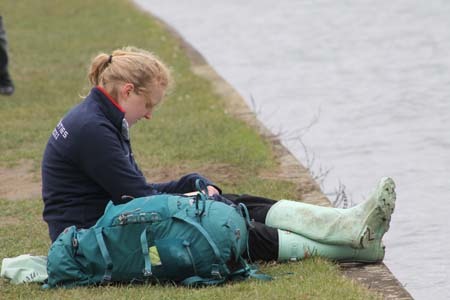 The 42nd annual Oxford and Cambridge Lightweight Boat Races took place in challenging conditions on Saturday, (19 March). 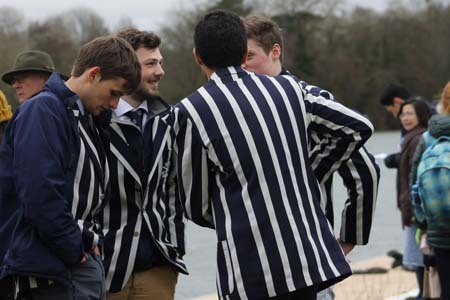 The famous Henley Reach provided a chilly and windswept venue for this annual showcase of Oxbridge lightweight and college rowing. 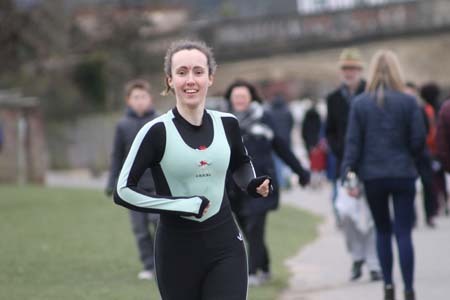 A blustery north-easterly and strong stream, meant rough conditions over the whole course and particularly in the early stages of the races, which are run in the opposite direction to the Royal Regatta. 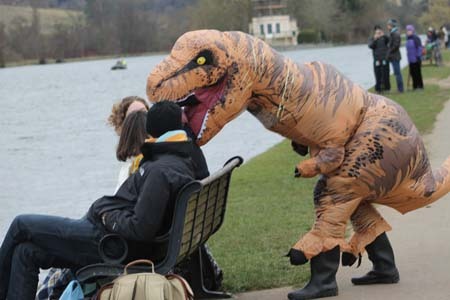 The Henley Boat Races, established for the men’s lightweight race in 1975, were also home to the Women’s Boat Race until 2015. 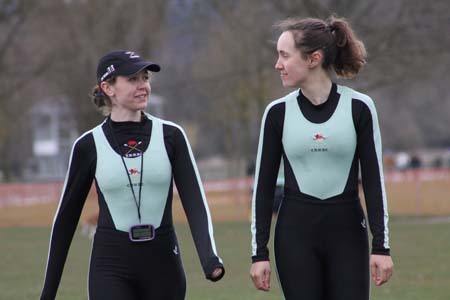 This year, for the first time, saw the addition of women’s lightweight pairs and OUWBC v CUWBC alumnae racing. With 2011 Lightweight World Champion, Steph Cullen, presenting the prizes, and a row-past by the 1986 women’s lightweight crews from both universities, the day not only provided an excellent platform for male and female lightweight rowing, but also reflected British Rowing’s current initiative to celebrate women in rowing. 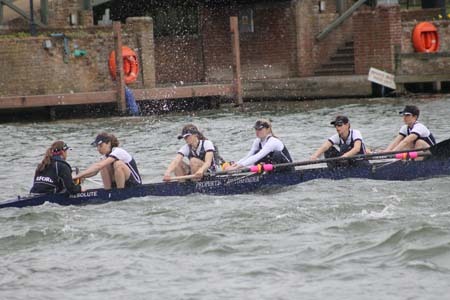 The first of the two ‘blue riband’ events was Women’s Lightweight VIIIs. In 2015, only 3ft separated the crews and 2016 saw another exciting encounter. 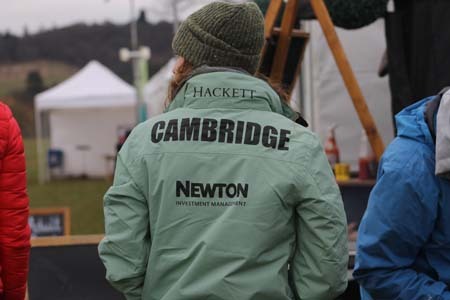 Both crews started well, but with a slightly more aggressive start, Cambridge took the early advantage, achieving a lead of 1/3 length by the end of the enclosures. Cambridge, on Berks, settled to 34 with Oxford slightly higher at 35. Approaching Upper Thames and the Oxford camp, Cambridge made a move, extending their lead to ½ length, but Oxford responded and the difference remained only 1/3 length at Fawley. With the two crews neck and neck it was clear that another classic race was in progress. Oxford increased their rate of striking to 36 approaching Temple Island and put their bow-ball in front for the first time. Cambridge responded in kind and again took the lead, but the Oxford momentum was irresistible and they crossed the line ahead. Verdict, Oxford by a canvas in a time of 6.54. The finale for the day was an impressive performance by the Cambridge men, who overwhelmed their dark blue opposition. Both crews had a strong start. Cambridge, striking 41 against Oxford at 38, quickly established a lead. 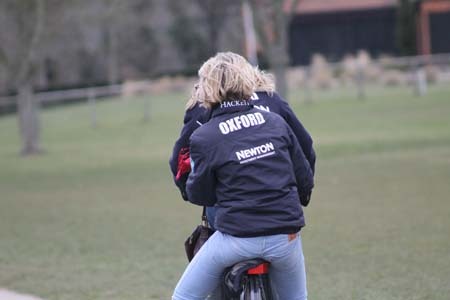 Oxford, on the Bucks station, although technically very proficient, were unable to match the power, length and finishes exhibited by their opponents. 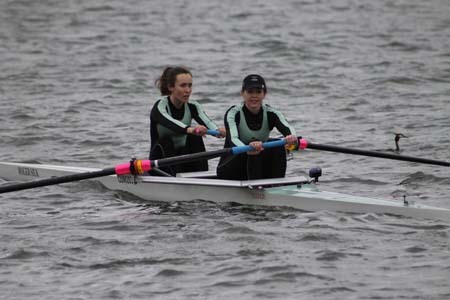 Cambridge were two lengths ahead by Upper Thames, leaving the Oxford cox a huge challenge to lift her crew to respond. Striding at 36 Cambridge looked relaxed and clean, extending their lead to 2 ¾ lengths by Fawley. 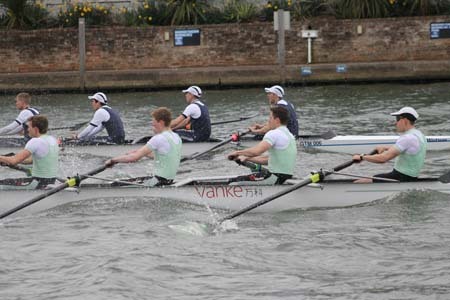 From this point on the task was impossible for Oxford, who kept attacking as the water improved, but this was a dominant performance from the men in light blue who crossed the line well to the good, in a time of 6.19. 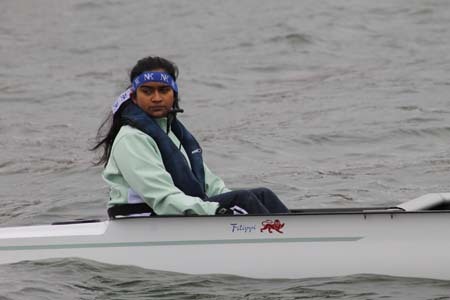 The inaugural event for women’s lightweight reserves, contested by women’s pairs, was a monumental tussle over the full distance of the course. 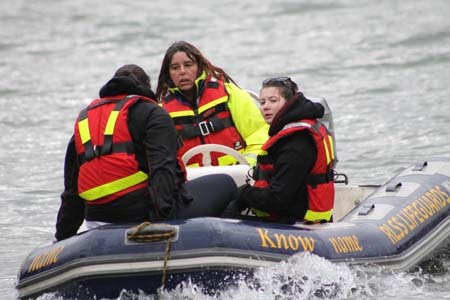 Waves and wind proved to be an additional challenge as the crews sought to settle into their race plans. Both crews were warned at different times by Umpire Dave Hancock, with Cambridge, on Berks, finding the course in the centre of the river a difficult one to steer. 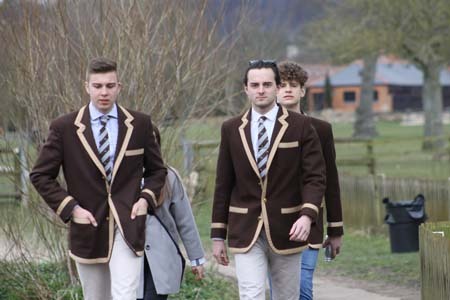 At Upper Thames, Oxford held the initiative, but a Cambridge push reduced a 1 length deficit to only 1/3 length by Fawley, and they took the lead at Remenham Farm. The more sheltered water close to Temple Island allowed both crews to increase their rate of striking as they surged for the line. 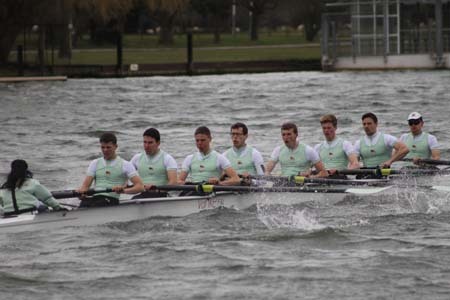 Oxford pushed hard, but Cambridge were able to respond one last time to take the race by ¾ length. At no time did more than 1 length separate the two crews. 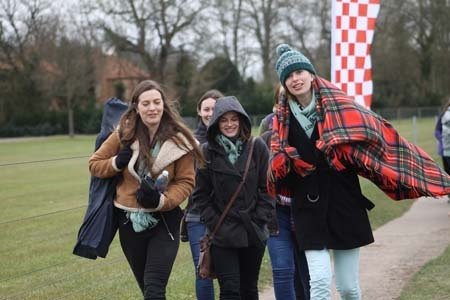 In the Women’s Inter-Collegiate Eights Race, both crews were challenged by the choppy water on the start; Christ Church (Oxford), on Berks, going off at 45 to Jesus (Cambridge) at 41, with plenty of water flying. Christ Church, with cleaner blade-work, settled to 34, establishing lead of 1/3 length by the end of the enclosures then clear water by Upper Thames. With Jesus struggling to find rhythm in the strong headwind, a tidy looking Christ Church extended their lead to 4 lengths by the finish. 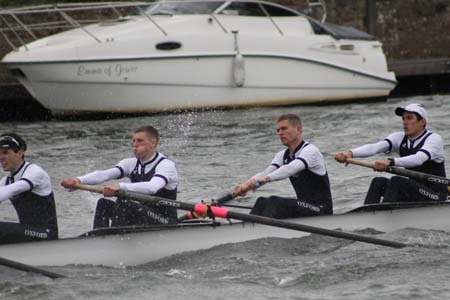 The Inter-Collegiate Men’s Race featured the ‘Head Crews’ from the Oxford Torpids and Cambridge Lents. 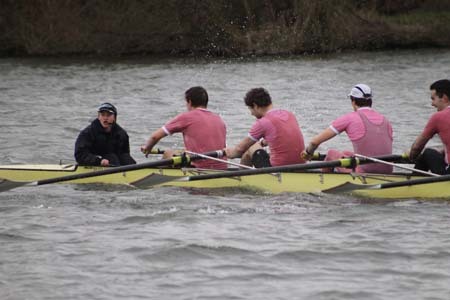 This was the third time Caius (Cambridge) and Pembroke (Oxford) had faced each other at the HBR with Caius victorious in 2011 and Pembroke in 2012. On the Bucks station, Caius, starting at 43 had the best of the early race, leading by ½ length but, settling to 34, were unable to break free. 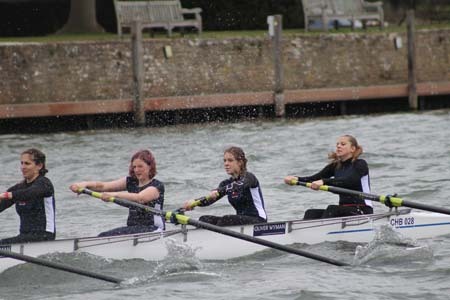 Despite shipping water in the rough conditions, Pembroke maintained a strong rhythm, pushing hard at Remenham and reducing the deficit to a canvas by Fawley. Towards the finish Pembroke struck a floating obstacle and lost use of their rudder. Cox, Anna Carberry, using her arm to steer was warned and came close to fouling her opposition. No clash took place, however, and Pembroke increased the rate to 36, taking the lead for the first time as Caius faltered under the attack. The result a win by 1 length for Pembroke. In the Alumnae Race, both universities presented crews full of talent. The popular motif ‘this girl can’ being an accurate summary of the academic, sporting and career achievements of the competing athletes broadcast by Race Commentator, Robert Treharne-Jones. 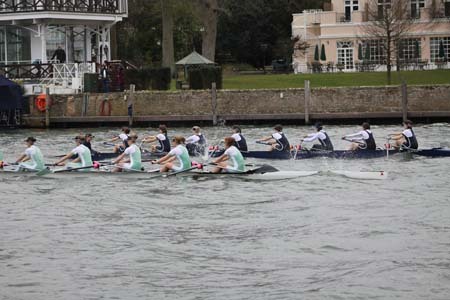 In the race Cambridge stroke set off at a lively 33 strokes per minute, significantly overrating Oxford, on Bucks, at 26 and laying down a challenge that their opposition could never quite live up to. 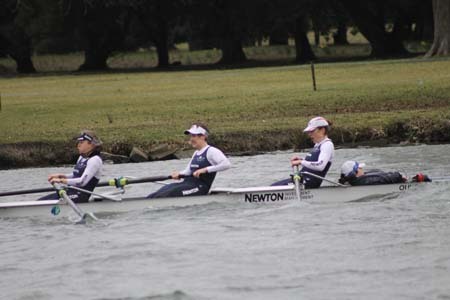 Both crews coped admirably with the water conditions although Oxford’s lower rate in the headwind probably accounted for their deficit at Fawley. In the closing 500m Oxford, finding a better rhythm closed on Cambridge, but it was not enough as Cambridge crossed the line 1 ½ lengths to the good. A brief wave of triumph from the Cambridge boat acknowledging that the old rivalry was still alive and well.